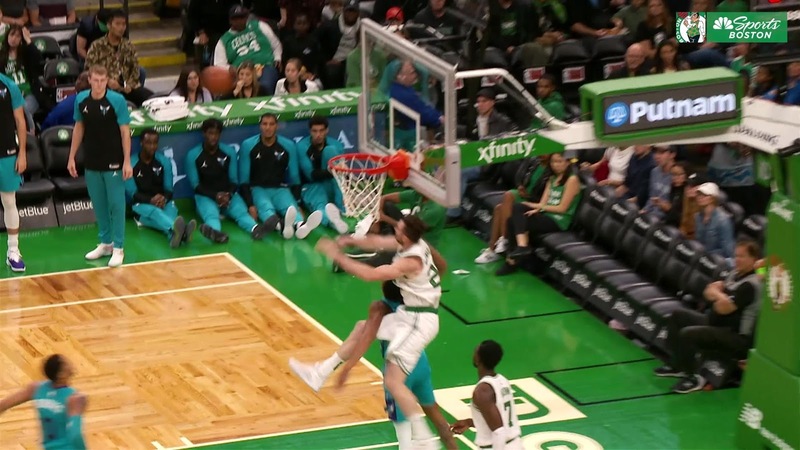 Gordon Hayward as rim protector - who knew? Gordon Hayward has picked up a block in each of the first two pre-season games, both against the Charlotte Hornets. I knew that he was an all-around player - but rim protector? His chase-down swat of Jeremy Lamb's breakaway was Lebron James-like. That block was important in several ways, but more on that in a minute. Gordon played 21 minutes in last night's win over the Hornets. He only scored four points on poor shooting - came close to fouling out - but had four boards, three assists, one steal and one hell of a block. We knew he'd be rusty, but thus far the only shaky parts of his game are his shooting accuracy and being foul-prone. The ankle seems just fine. I checked Hayward's career stats, and they only show an average of 0.4 blocks/game in 31.3 MPG. His block of Lamb was spectacular, and at least to me, very un-Gordon-like. But of more importance, I reviewed the block almost frame-by-frame in the video and found that he landed squarely on his left foot and seemed to suffer no ill effects. Gordon Hayward just went all out to swat Jeremy Lamb and landed with all his weight on his left ankle. He popped up fine. If you have a play like that (chase-down block on Lamb), that can kind of turn the tide around! Of course, Brad's meaning was that this could be important for Gordon gaining confidence in the health and solidity of his left ankle. Okay, I know it is only two pre-season games, but has Hayward added a new dimension to his game? I never would have expected that type of stellar defensive play from his second game back from a cringe-worthy ankle break and dislocation. I will be paying attention to his stat lines as the season progresses - and watching for that 1.0 blocks-per-game to hopefully continue. It's just great to have him back.